A photo of JYJ’s Kim Jaejoong celebrating his birthday was released today. On the 26th, C-JeS Entertainment posted a photo of Kim Jaejoong celebrating his birthday on JYJ’s official Facebook page. According to a representative, the photo was flooded with congratulatory messages from fans all over the world as soon as it was posted, heightening the anticipation for his fanmeet tonight. 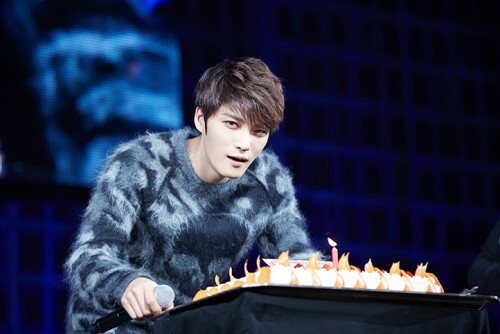 The photo shows Kim Jaejoong looking at the camera while he stands in front of a birthday cake. True to his nickname ‘Visual Shock’, Kim Jaejoong’s intense gaze and good looks was met with an explosive response from fans. Kim Jaejoong will be holding his ‘2015 KIM JAEJOONG J-PARTY IN SEOUL’ fanmeet at the Jamshil Indoor Gymnasium tonight (26th) at 8pm KST.